Halo sequel shows new modes at Comic-Con. Bungie has unveiled two new modes for Halo: Reach at Comic-Con. Forge World is a huge, customisable landscape for the game's Forge map editor, while Versus Firefight allows players to play against each other as both Spartans and Elites in the previously co-op-only mode. You can find basic details of both in Microsoft's press release. Forge World, demonstrated in Bungie's video below and previewed in detail by IGN, is a new setting for the Forge map editor that uses the new Forge 2.0 toolset. 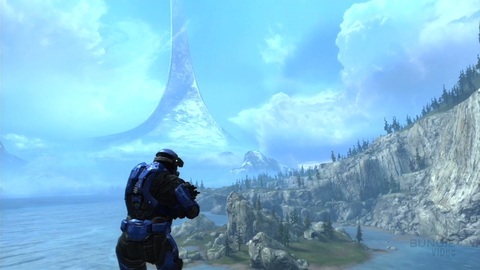 Set on a Halo ring, Forge World features five game maps melded into a single contiguous space and allows eight players (four in split-screen) to fly from one to the other to create, edit and play. The Forge 2.0 tools include UI improvements, snap rotation and custom physics. Bungie's made several maps with Forge World that will ship with Halo: Reach, including remakes of the classic Blood Gulch and Ascension maps called Hemorrhage and Pinnacle. Versus Firefight, meanwhile, pits a team of two Covenant Elite players, with AI support, against two Spartan players trying to survive. According to IGN's write-up, killing a player Elite grants a Spartan a bonus life and a score boost. Elites don't score, but have infinite lives. At the end of a round, players swap sides, the winning side being the one that racks up the most points while playing as Spartans. Kotaku reports that Bungie also showed off a new vehicle for the game: a forklift truck. Halo: Reach is released on 14th September worldwide alongside a special custom 360.